Learn how to make festive and jolly jewelry pieces for Christmas with these easy projects! 6 Fun and Free Christmas Jewelry Projects eBook is just what you need this season to make jewelry that will help put you and keep you in the holiday spirit! These Christmas jewelry projects are fun and easy to make for yourself or for someone on your list. It can be overwhelming to try and buy gifts for everyone you care about this time of year, but with this free eBook you can easily make some ladies close to your heart some fun holiday themed jewelry or just a pretty jewelry set that they can wear all year long! Inside this eBook you'll find simple beaded Christmas jewelry projects that look intricate and beautiful once they are finished, simple Christmas jewelry projects to help take your mind off of all the stressors yet still on the holidays, and Christmas gifts to wrap up in pretty little packages and surprise your friends and family members with. Download your free copy of 6 Fun and Free Christmas Jewelry Projects today! It’s that time of year again! Jingle bells, snowflakes, and Christmas lights will not be escapable. Why not get in on the fun and show off your holiday spirit? That’s exactly why we put together this eBook of free Christmas projects that you can make for yourself and gift ideas you can make for your friends and family. Let’s face it, there’s nothing better than getting a thoughtful hand-made gift, so use some of these project ideas to give someone in your life something special and unique. Either way, we hope you find something fun and festive to put you in the best holiday spirits this year! This eBook is a collection of our favorite bloggers, jewelry designers, and jewelry companies all together in one place. 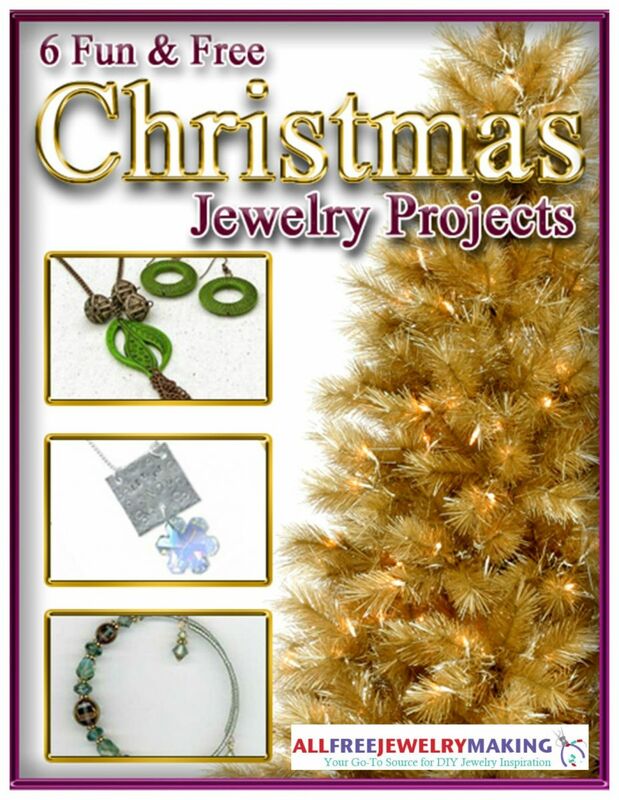 Download your copy of 6 Fun and Free Christmas Jewelry Projects eBook today! What kind of Christmas would it be without a Christmas tree? These beaded Christmas tree earrings are the perfect little holiday reminder that Christmas is coming and it'll be time to put up the big tree soon if you haven't already. The Christmas jewelry instructions for these earrings in this eBook are very detailed and include step-by-step photos making it easy to follow along and create your own even if you've never beaded before! Once you've gotten a hang of it, you can make a pair for anyone you know who can use a little lift of Christmas spirit. Whether you are all about keeping presents under a real tree or fake tree during the holiday season, you can still benefit from this DIY earring pattern. 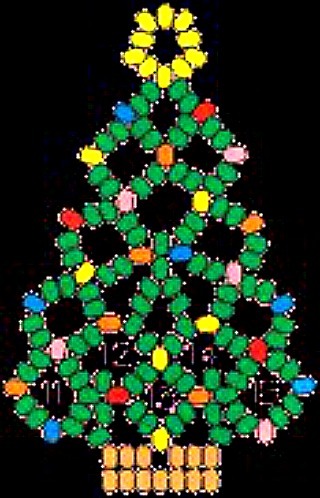 Plus, this seed bead pattern is completely unique from other beaded earrings you might come across! It looks very intricate, but the picture tutorial makes it super easy to recreate. It's also a great way to use up any stash of loose seed beads you may have laying around for some pretty colored "ornaments". This pretty jewelry set is just what would make someone smile on Christmas morning when they opened up the box. When making Christmas gifts, jewelry is a fantastic option because you can make something pretty and useful that is tailored to your recipients' specific tastes. 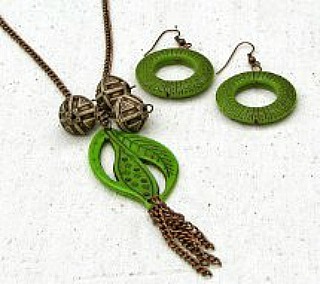 The set in this free Christmas eBook is great for lovers of nature, green, copper, or just pretty long necklaces. Besides, giving a set is like giving two gifts in one because they can always be worn together or separately. This project by Vicki O'Dell uses parts of an old necklace to make up a brand new one, you can easily make great Christmas gifts using the same idea and put smiles on the faces of your friends and family with your handiwork. It's true that there's no better feeling than giving, but receiving compliments can make you feel pretty good too! Need more holiday spirit boosters? 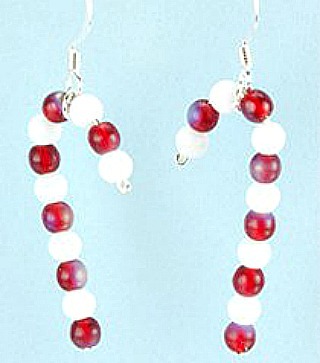 Then take a peak at this free eBook for instructions on how to make these beaded candy cane earring. They are incredibly simple to assemble; you can make an entire batch in less than half an hour. This Christmas jewelry project is the perfect little pick-me-up after a lot day of shopping for gifts because there's is no frustration in making them, but they'll still put you in the holiday state of mind. If you have more than just red and white beads, make candy canes in all your friends' favorite colors as little party favors at your next Christmas party! Another red and green crystal weave bracelet, featured in this eBook, is a simple yet classic piece that you can wear around the holidays or all year long. The crystals in this Christmas jewelry project mimic Christmas lights making it a great accessory to wear for your next Christmas event. This bracelet project uses the right-angle weave to create the delicate design. Right-angle weave is one of the simplest weaves to get a handle on. Once you've made this Christmas bracelet project for yourself, you can quickly make several more in different colors to give as Christmas gifts to everyone on your list. You can easily download and print out each book for on-hand reference while jewelry-making. For help downloading our eBooks, check out the FAQ here: How to Download our eBooks. Weekly emails with free jewelry making projects, tips, collection pages, videos and more. Chances to win jewelry making books and products from our giveaways and contests. New FREE patterns and projects made available to you throughout the year. Access to our free pattern library full of 100’s more free jewelry projects. The opportunity to share ideas and help others in the beading community. We hope that 6 Fun and Free Christmas Jewelry Projcets has inspired you to start creating your very own holiday themed jewelry and enjoying the holiday spirit! The title left out the third "F". You have fun, and free. You should add fantastic! I saw some that I have never seen before. And every one of them is easy to make and not expensive. One trip to the dollar store will get me enough supplies for a bunch of them! The candy cane earrings were a big hit this Christmas. The first few pair I made exactly as directed in the instructions but then I decided to size it down and used seed beads. Most people actually preferred the smaller ones and I could use a shorter, thinner gage head pin which really saved my fingers! Thank you so much! This ebook had a pattern that I had some years ago and had lost! Thanks for restoring it to me!! !